“Never take for granted the fantastic phenomenon of obtaining new knowledge,” explains Kirklin L. McWhorter. A biochemistry major with a minor in philosophy, Kirklin is proud to represent the College of Sciences and Mathematics (COSAM) as this fall’s Graduation Marshal. 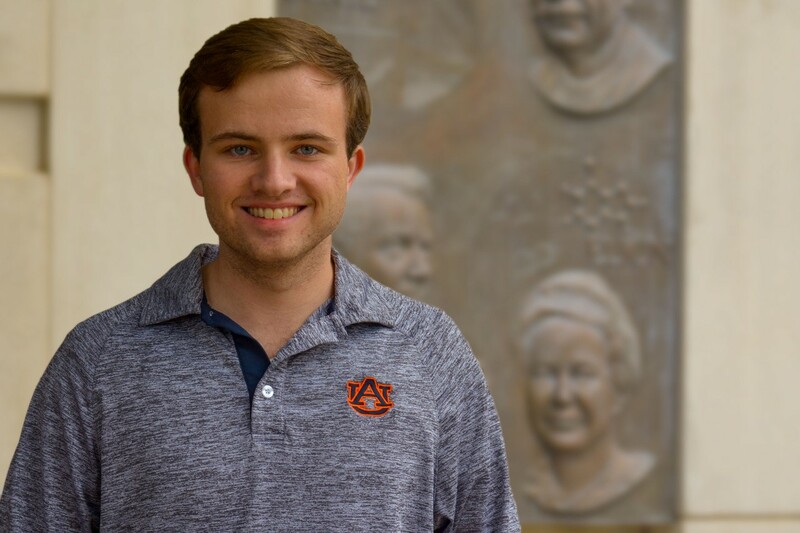 “My experiences at Auburn University have helped me find my true passion for teaching and research,” he shares. Originally, Kirklin was going to graduate with his bachelor’s degree and enter the workforce. He never thought about earning a doctorate degree, teaching students and conducting extensive research. That all changed when he became an undergraduate research assistant. Kirklin joined a laboratory in COSAM and studied the enzyme KatG. Kirklin began research the summer before his junior year as part of a Cellular and Molecular Biology Fellowship. He was the recipient of the David Bond Haggard Fund for Undergraduate Research award. He then continued he research in Dr. Douglas Goodwin’ lab. These opportunities as undergraduate research assistants opened his eyes to a new career path at a research university. “There are undergraduate researchers who come into the lab and make an important contribution to your group’s progress; that is always a great thing. There is also the kind of student whose contribution changes the way your group thinks about the project. Kirklin is in that latter category. His impact on my group has not only been scientific, but also interpersonal. Kirklin has a passion for science and research that is infectious. He has quickly become a leader and mentor for newer students joining the lab,” explains Dr. Goodwin, associate professor in the Department of Chemistry and Biochemistry. Kirklin is seeking to embark in a career in higher education where he can run a metalloenzyme-centric lab conducting research as a primary investigator and teaching future scientists how to be successful. COSAM Graduation Marshal Kirklin L. McWhorter.